Most of the dog fancy exists in a kind of quasi-religious system in which different people become high priests and priestesses and certain bromides and mythology become established dogma. Dog culture is less concerned with evidence and objectivity than it is about conformity and obedience. Those who question either the high priests or the dogma are either subjected to a severe inquisition or excommunicated. In the case of Salukis, they print the heretic’s e-mail in one of their publications. It is really nothing more than a petty vendetta. Someone who believes got into an internet war with a particularly ruthless (and well-informed and somewhat blunt) skeptic. The believer contacted another believer, and so they hatched a diabolical scheme to fix her wagon. Print some quotes in our magazine. This is how the high church deals with heretics. For Lollards soon turn into Luthers. And the last thing these people want is some kind of Reformation in which things like “blood purity for blood purity’s sake” and the taboos against a certain striped coat pattern might be openly questioned using empirical methods. Like all defenders of the faith, these high priestesses must defend the dogma. But this is just pathetic. And when they tried to answer using the dogma, the evidence was wanting in so many ways. That’s the game that has been played ever since the registries were closed and the Great Schisms between fanciers led to the creation of a many Balkanized gene pools from what were once dynamic bloodlines that contained a wealth of genetic diversity. But the values inherent in that game are being lost. Their currency doesn’t set will with a greater number of people every year. The institutions, the clergy, and the dogma no longer sound legitimate. And at that level, change is coming. It comes bit by bit. Then there’s a great leap. And back to bit by bit. But sooner or later, things will change. These little games are but an amusing sign that these people are desperate. Desperate for times in which what they said was accepted as the absolute truth. For this is the system whose values they accepted and mature in. It is within that paradigm that their views of what is successful and what is correct are fundamentally shaped. But what happens when that paradigm is fundamentally shaken? The answer: Resort to cheap insults. Maybe it will go away. But it doesn’t change that the dogmas inherent in the various dog cultures are being openly questioned on so many levels. New ideas are seeping into the belief systems. The internet allows all of us access to different perspectives on these issues. We don’t have to believe because that’s the only thing out there. We can question. We can innovate. And that bugs the hell out of these people. Here’s to more general Lollardy in the dog world! 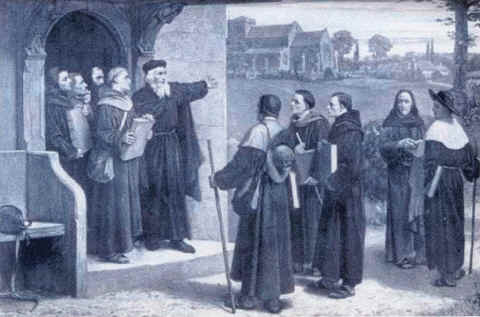 John Wycliffe speaking to his fellow Lollards. Good thing they weren't in Salukis or their e-mail addresses would be published! Lollard just *sounds* so uncool. Like a kind of candy. I was actually going to do a political and religious commentary blog that I was going to call General Lollardy, but I decided against it. Lollard sounds like Lolly-gagging or “Low Lord” to me. At least that is what popped into mind. These folks sound like the “hench whores” that a few friends and I had dealings with earlier this year. Although the subject matter wasn’t dogs, it got just as heated with an entire forum set up to bash us. Unlike Jess, I published their user names, full names and rough locations so the whole world to see their hypocrisy. Let’s hope their employers figure out what they were doing for hours and hours on a daily basis while on the clock. Jess – I love your disclaimer! I bookmarked it for further reading. Dogdom, like any other fandom/creed/political affiliation, has a way of bringing out amazing amounts of crazy. My breed of choice, the GSD, is unfortunately popular with a certain stripe of fanatic that also adheres strongly to things like racism, so the “pure breed” thing ties in with “racial” purity, etc. I avoid those individuals as best I can, because you can’t fix stupid, and most certainly not over the internet. It’s sad, though, that when I would just like to perhaps chat with people who also like GSDs, I have to wade through a gauntlet of wingnut propaganda and survivalist crack pot maundering. I’m sorry your friend is being pilloried as a result of some very personal vendettas. Hopefully this incident will return to bite the instigators most prominently on the rear. It won’t bite them in public. I have yet to see the more outrageous actions of members of the Saluki community condemned publicly by other breeders. I get private messages of support, but the only people who go public are either not Saluki people, or they are fellow exiles. It is more a source of amusement than irritation, but the fact that it not only happens, but that there is a culture of approval for these sort of actions within the dog community is kind of…weird. I suppose this whole “school clique” attitude is worsened by the fact that the Saluki fancy is relatively small in the west. No one who is “in” wants to be banished to the “outside” because there are no alternative groups to join. Sad. For what it’s worth, I’ve read your very interesting ideas about interbreeding and preserving the “landrace” status of Salukis and related sight hounds. I really wish that someone would undertake that for other varieties of dog, because I can see where it’s really in the best interests of the dogs (both from the point of view of health and function). Unfortunately people seem to love to be “exclusive” though, and look down on cross breds (unless they’re “designer dogs”). Granted uncontrolled crossing between unrelated types doesn’t necessarily produce something that’s functional for work (depending what you’re doing), but if it’s done thoughtfully it would certainly produce good dogs, with good genetic variability. People like their dogs to be unique and not share characteristics with other breeds. The thought that one ‘breed’ may actually be a small part of a much larger group is not happy. The emphasis on purity is part of that, isolating the blood for generations increases the specialness. There are other groups to join, they just are not ‘official.’ One day, they will be, I think. I want to buy a Brindle Saluki to breed back into the Border Collie gene pool just to piss everyone off. I really really do. There is a line of brindles that is highly suspicious of having some Greyhound blood in the background. That line originated in the UK (the other lines are of desert origin.) I stated on one of the Saluki mailing lists that I’d like to get one of these brindles, and show it myself, wearing a t-shirt that says, “Yes, it IS a purebred Saluki.” Nobody thought that was funny, for some reason. Love the voice actress, June Foray: Rocky the flying squirrel, Granny, Lucifer the Cat, Witch Hazel, Cindy Lou Who, Natasha Fatale (BORIS! ), and many more. You know, Maybe I’m just a part of the demographic that really just thinks the dog fancy is crazy. That these fancies are comprised of people who either have more money than brains or just want something to believe in so they can bond with others behind a common cause and feel needed, wanted by their brethren. Even if that cause is dated and mostly fabricated from fictional old school romanticized imaginations and perpetuated by standards that died maybe a century ago when times were different and the demands of our working animals were different. Nowadays the average person tends to roll their eyes at the person who says “oh my dog is a show dog” Sorry, but all you trail and show people….let it be known the rest of the world….Thats the majority of the world out there, yup right outside your small circle of dog fancy friends… Think you’re all crazy. Then lets add in the intelligent professionals in the Veterinary and the Genetics fields. They mostly think you’re crazy. And then there’s the Medical professionals in the Human world….. Yup, most of them think the dog fancy is nutty, too. “So why do you do it” we are often asked. If you hate what they represent so much why even waste your time. I say….because once in a while its refreshing to actually be there for those who are seriously looking for the truth and want to see firsthand what its all about. And to hear it from someone who’s doing it to the benefit of the dog, not for the benefit of their reputation and their circle of friends in the fancy. When a person who’s just a bystander, who’s from the curious public comes in and is looked at by the breeders and handlers like they will catch on fire for getting near any of the dogs on exhibit, then its sending a very strong message that reinforces what most of the world outside the fancy already believes. That they’re crazy. So it’s a breathe of fresh air to actually talk to and get a positive from those same people who would normally be told to keep away from the dogs they came to see in real life. And it gives us the opportunity to tell the truth about the real situation within the purebred dog industry. Yes its an industry driven by the clicks that are the breed clubs…. The winners, the Same sires and the closed registries. And its fun to see people nodding in approval then looking around at all the very non-social types grooming all their dogs and trying to ignore them. They see the light. They understand the difference and they agree with what we are doing and encourage us to keep doing it. And its because of those people that we continue on. And if don’t win…. so what. We still get to interact with real world people and speak a bit about the truth they need to hear and really want to hear. Not perpetuate the myths and the lies. And we usually get to do it with our friends and family and fans there happy to see us. And when we dare to go around the ring with a Yellow FCR dog or a long haired Weimer dog or a Long haired Vizsla Etc etc etc. We will make a statement that at least we care enough to challenge the status quo. Because that same status quo….has failed for the most part on every level. They’ve failed the very dogs they put on that pedestal for the world. And they do it in the name of conformation and Trials. I’ll take the pet with a diverse lineage and the sire that no one’s ever heard of, and if it bests the dog with the close relations to the majority of others like it and manages to live longer then I’ll gladly brag about that before a ribbon, a trophy or a championship, thank you very much. For the rest of you who throw threats or trash talk and mudsling. Bite me. My kids and my relatives and my friends are plenty. Basically …. Unstoppable. We’re going to be here for a LONG time. And our network of like minded people is GROWING. And eventually, what we have to offer will be what defines a better overall dog. For the a hunter, for a family for people who put more value in what they have that they prefer its not produced from the heartbeat of the eugenics movement. That practices that brought racism and bigotry into our world should also no longer apply in the world of our best friends. Hi just curious, What breed are you showing? Do you have a website? I am now your fan on Facebook! And your pack is wonderful too. on November 1, 2010 at 12:07 pm M.R.S. Perhaps y’all should read your own comments. I have yet to make a ‘cheap insult’ towards the dog fancy. Unless I am attacked directly, which is what happened on Facebook, I rarely respond in kind. Pithy observations, yes. It’s too easy, because at it’s heart the conformation game is inherently corrupt and based on dogma. But I know far too many people who play the game and do ‘get it’ to condemn the entire fancy out of hand. It is disappointing that most of the these people are too afraid of retaliation to speak up and say this kind of thing is wrong. What these two women did, was far beyond cheap insults. That is what mailing lists are for, not breed club publications. I would have a good case, should I choose to bring charges in the UK, against them for libel, because their comments were quite obviously a deliberate attempt to ruin my reputation and influence the Saluki community against me. Since you are involved in a breed club, and in ‘protecting’ your breed, maybe you think it’s okay to libel somebody in a breed club mag that has an international audience. That’s your prerogative. It’s my prerogative to defend myself when attacked. on November 1, 2010 at 4:39 pm M.R.S. Jess…I was not speaking of you specifically. Your comments have generally been more sensible and thoughtful than have some of the others. if you have a purpose and a goal for crossbreeding/outcrossing (and I’m fairly sure that you do), take good care of the dogs and represent them as exactly what they are, hey, I’ve no problem whatever with that. Certainly I do NOT agree that it is acceptable to libel or defame anyone on a basis of opinion or misstatement or lack of factual knowledge. Unfortunately, that sort of thing seems to be far too common on the Internet. I see things clearly from Jess’ perspective. M.R.S. I certainly respect the experience you bring to any discussion and your perspective is more open minded and in tune with the real world than most. But Jess, is just being taken to the matt by bullies. In the end that’s what they are. Bullies. Who for their own conformist reasons disagree so strongly with someone doing their own thing for all the right reasons. That they act out in some very negative ways. They make assumptions about people and label them with stereotypes without having ever met them. Without knowing you or having witnessed your endeavors firsthand or questioned others who do know you and have seen all the merits from the time you’ve invested into your dogs. And the care you put into them. The time you take to know where they will be going and learning more about the people expressing interest. It’s very narrow minded for those same fanatics to already have judged you. And to drive the bus over you in the arena of public opinion…. they better damn well be prepared to back up their claims. Because in today’s world, it will come back and sting you. Public opinion no longer just sits there and takes “their” word for it anymore. In fact, when confronted with a simple rebuttal of “Prove it”. Every time those same fanatics fall flat on their faces. And yet they seem to ignore the fact that the rest of the world is shaking their heads in disbelief over their behavior. The whole world has caught up to their game. And we’re no longer listening to their tall tales and excuses. Its time to find peace with themselves and just accept that they are the problem not the law.